For Connor Bradley, starting a new job as an animal waste relocation operative, life is about to take a turn for the weird as he finds that the world he thought was confined to the books he immersed himself in as a child is more than fiction: to his new colleagues they’re a family history. Connor finds that the Endangered Creatures Programme at London Zoo was originally set up to protect Humans, is run by Dragons and staffed by Goblins, Dryads, Manticore and a whole host of other creatures once thought to be mythical or extinct. "The premise of “Endangered Creatures” is a fabulous idea for a story. A secret world living under our noses. Dunkley gives us a good background on the creatures that is both plausible and entertaining." The premise of “Endangered Creatures” is a fabulous idea for a story. A secret world living under our noses. Dunkley gives us a good background on the creatures that is both plausible and entertaining. These dragons and most other creatures are thinking beings living much like the humans around them. The leader and father of the dragons, Bob, decides that there is no sense to wiping out humanity when they’re so bad for a dragon’s health so why not use them to their benefit. Make an alliance with those who want to rule a trade to get what you want, a quiet life. While I truly enjoyed the premise of the novel, the execution left something to be desired at times. Toward the start of the novel, Bob has a theological discussion with the King that seems forced. When Bob was negotiating with the King, the conversation fell into natural rhythms but the start of the scene read as a bit shrewish on the part of Bob and while he’s openly mocking I had the sense that the author was trying to find the lines that would be too far and waffles to the point where the King comes off having the savvy and intelligence of a clown waving in the wind so that the commentary is negated. The good news is that from the moment Connor’s difference is “discovered,” (toward the last 1/3 of the book) the story comes into its own. The flow and pacing improves and the awkward Bambi on Ice feeling of the writing earlier in the story evaporates. By the end of the story a full promise of fun, adventure and overall difference is fulfilled. I have seen this work compared to Douglas Adams but I’d lean more toward Jasper Fforde for conveying a similar fun. I will tell my followers that they should stick with this author because with this was good whatever he does next is going to be spectacular. Practice has paid off. Highly Recommended, Left me wanting more. "The feeling I got from this book was the same pleasure I felt when Pratchett first broke onto the scene"
The premise of the book, that there is a hidden society of mythical creatures continuing to live among us, or in a 'protective' captive breeding programme, requires the reader to suspend disbelief. After the first chapter or so my disbelief had been abandoned like the owner of a silver saloon who leaves it in the carpark of a vast shopping mall, and then goes home by bus. The feeling I got from this book was the same pleasure I felt when Pratchett first broke onto the scene, Dunkley is a new author and his imaginary world creates something new entirely. I greedily read the entire book in two sessions, which would have probably been one sitting had not the device I was reading on run out of juice part way through. I'm not going to spoil the book by giving away too much of the plot or storyline, but if you like humour and need something to take you out of yourself for an hour or two, this book will be for you. I hope the author writes some more, as this is a fresh, newly-minted imaginary world. It's light-hearted and believable in an unbelievable way. My main observations would be that the opening scene was a bit sparsely written; Dunkley's style improves further into the book. There are a few sentences that didn't quite hang together in English as she is commonly written, which stopped the flow of reading somewhat, but for a first book and a self-published one at that, this is an accomplished bit of writing. I'd have liked 'more' - the book could have been fleshed out quite a lot - some of the characters for instance could have been developed further which would have added to the enjoyment of the reader. There was a little too much dwelling on the motif of being clever at the cost of religion, in particular Christianity. This seemed to come across as a hobby-horse of the author which had been levered into the book without really adding to it. I hope in future writing this theme is omitted. I'm not religious, but feel this topic was overplayed. I'm looking forward now to the next book from this author. I'd certainly recommend that you read this one. 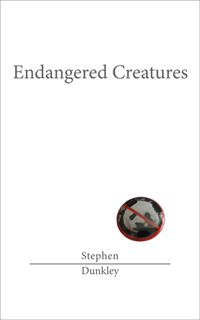 "Endangered Creatures is a very accomplished debut novel that sits somewhere between Terry Pratchett and Tom Holt in tone, and owes a heavy debt to Douglas Adams' particular brand of humorous observations"
It's a bit easy to go overboard with first time authors and comparisons. It'd be very easy to say that Endangered Creatures is a very accomplished debut novel that sits somewhere between Terry Pratchett and Tom Holt in tone, and owes a heavy debt to Douglas Adams' particular brand of humorous observations. But easy comparisons are boring. Endangered Creatures is a very accomplished debut novel. It's funny, well plotted, and packed with a well-rounded (if not always overly deep) menagerie of characters, and rattles along nicely without ever overstaying its welcome. There are some minor issues - some of the main cast are never really fleshed out, and one or two jokes fall a bit flat, but these flaws are comfortably outweighed by the charm and humour displayed throughout. Some attempts at humour - especially ones that poke fun at religion - can come across as snide, smug and superior, but not in this case. Endangered Creatures doesn't sneer. It sidles up to you, throws a welcoming arm around your shoulder and says "you'll never believe what I've just seen." Highly recommended, and I'm already looking forward to the follow-up. "A fun story with quite a bit of charm to it"
A fun story with quite a bit of charm to it. Hooked me from the start as some of the characters are quite enjoyable. Fluid story progression, with a well thought out start, middle and end. Sadly the main lead's persona was dominated by the other characters of the book, whom felt hollow in places. This was the only flaw to this book. This however left me unable to give it the four stars I wanted to give. For a first time author it's a very enjoyable read and I look forward to any future novels that he offers. "An excellent piece of humorous writing"
An excellent piece of humorous writing about, (minimising spoilers) hidden "mythical" animals and angels that refuse to fit the stereotype. The book fits together very well, with the jokes and comic timing working excellently, rather than going so over the top that they ruin it - the book just aches for a sequel (so many opportunities available!) and I shall wait in anticipation.